I would like this middle part to act like a giant structural wall supporting two sides of the building. 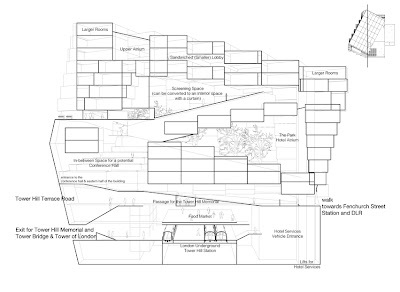 Viewing from the south, eastern and western wings of the building would be balanced hanging onto the gray part which is the giant wall on the drawing above. 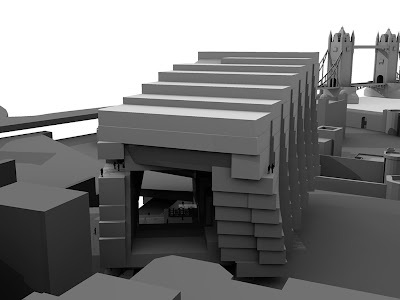 After the discussions on tuesday, I believe it will be very interesting to accept the hotel rooms as rough solid blocks and the rest of the building more like a transparent and smooth skin. The other end of the urban room opens towards the Fenchurch Street Station. 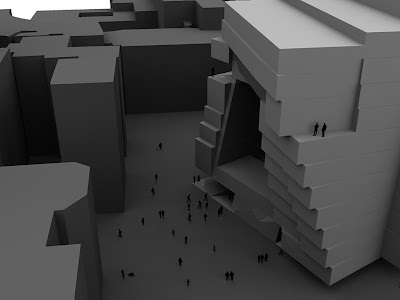 this is an image of the project I mentioned to you this afternoon. 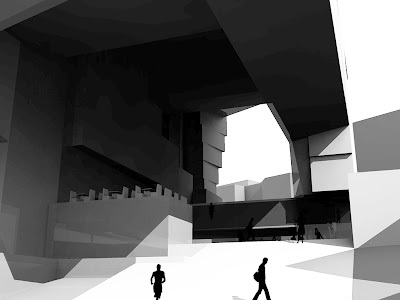 It is the design for a competition for a museum in Metz by FOA. Look at the pattern of opening in the facade. I do not know what they are doing to the interior in this project but the camera view like cones may work well for your project. The system of facade may be framing specific views and establishing specific relationships with the monuments surraunding your hotel. This is a structural study only for the envelope of the building done in SAP10, it's possible to see which parts of the building is weak weighting the Dead Load on this animation. 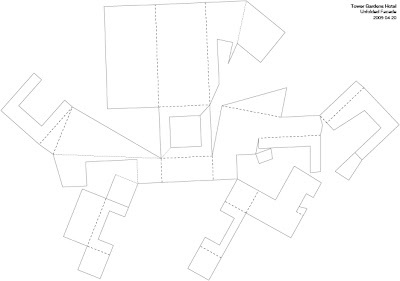 Unfolded facade is a useful template to show the weak points of the geometry - as an object. 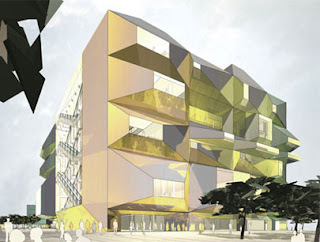 The real structure of the building will not be depending on a structural facade since the building is not that large. The famous right angled 3x4x5 triangle was formed by chance when I was looking for three continous vertical spaces which can accomodate the cores of the building. 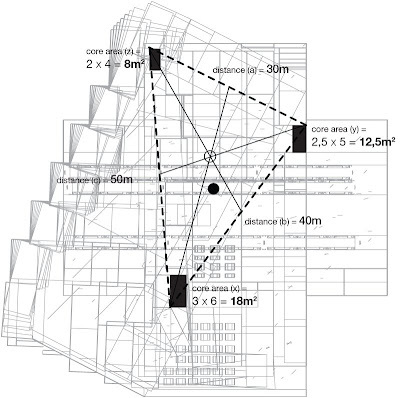 The center of gravity would not be in the middle of the building if all of the cores were same sized so I increased the size of the southern core (x) and gradually decreased the dimensions towards north (y and z) which moved the center of gravity for this triangle towards the center of the building. From this drawing, you can see how these three cores are cutting through the building at different levels. 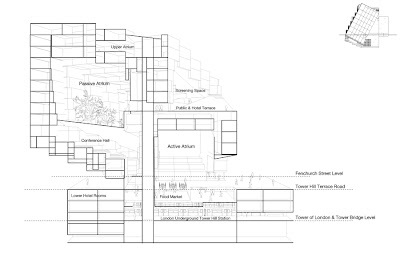 this is a large axonometric drawing - in progress - showing the proposal in relation to the site. 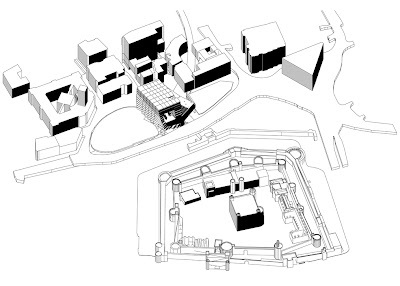 The ground level drawing. 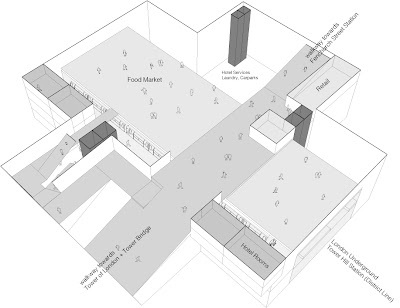 Showing the relation of a hotel room facing its back to the station and a food market; the busy walkway running next to it. You can click on the drawing to see the bigger version this time. Here is 2 new maps of the site. 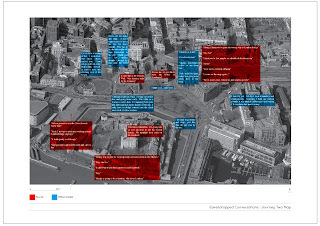 The first is titled Eavesdropped Conversations and the second is about User Movement were overlapping occurs between Tourists and Office Workers. 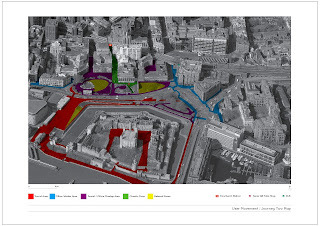 It also shows were areas of relaxation and congestion occur around the site. Hi Everyone hope you all are enjoying your break. I went to Tower Hill the other day and took some photos. Some bulidings has been demolished already and some parts of the site is under construction.